Gentle Friends, I was in the mood to bake something really Fallish, and with my MIL and nieces visiting this weekend, I knew it was serendipitous that I make her wonderful "Apple Cake." Just packed with apple flavour and Fall spices, it fit the bill and comes together so quickly!! ... 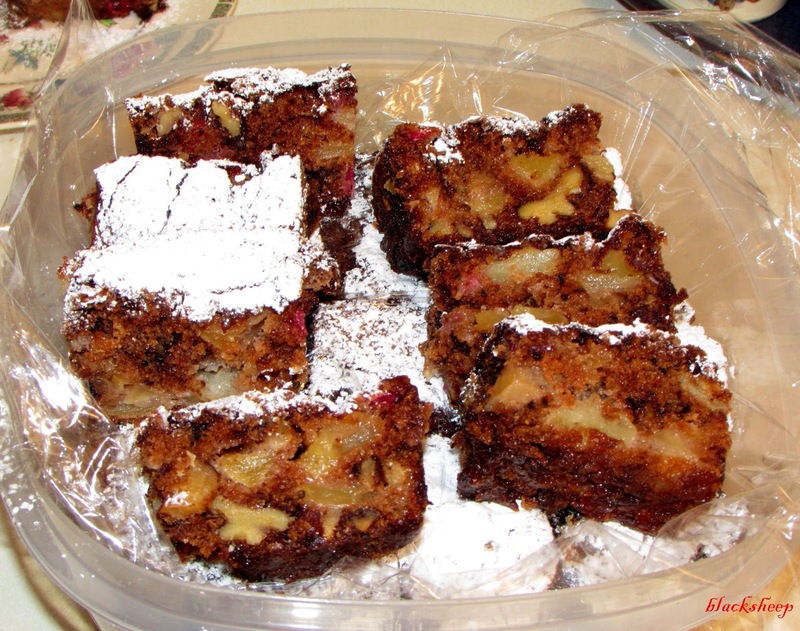 I usually mix up the apples to include some of everything available, each brings it's own deliciousness to the baked result.... and into this cake I tossed a double handful of roughly chopped cranberries, for colour and flavour, I really liked the additionally fruit!!! sort of bite sized, I sprinkled the top with icing sugar. 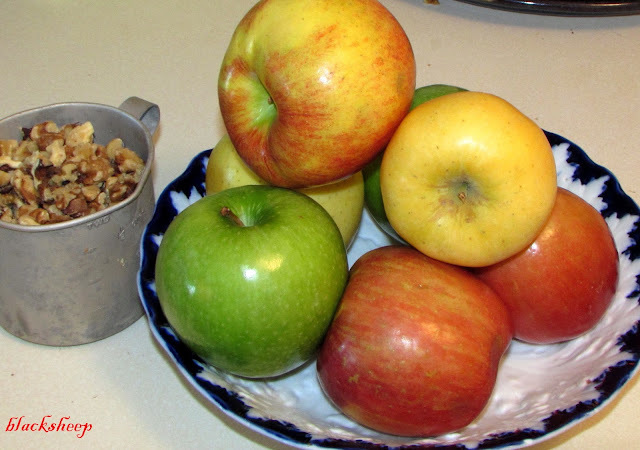 In the snap you can see all the nuts, apples and cranberries. With the additional fruit the cake was super moist. That's about it for today sports fans, thanks again for stopping by do stop again. Looks just delicious. I bet Rico's friends at work love you! That cake looks super good! You always bake the greatest stuff. I baked pumpkin bread using my zucchini bread recipe a few days ago. It was my second attempt and I think I got the amount of spices correct on this attempt so it's all good for Thanksgiving. It also needed a bit of extra oil due to the winter squash being drier than the summer squash. It was a hit at my husband's office. P.S. All these "I love pumpkin" people really like the spices, not the actual pumpkin. Grated pumpkin smells like jack o lantern and that is not an awesome scent. Got a good whiff of it as I shredded the pumpkin with my food processor. A bag full of apples here to process from a local grower.